China and Australia expressed support for free trade and open markets as they reaffirmed their relationship on Thursday. Both countries advocate free trade and benefit from it, State Councilor and Foreign Minister Wang Yi told reporters after the fifth China-Australia diplomatic and strategic dialogue with Australian Foreign Minister Marise Payne in Beijing. The two countries have reduced taxes on goods traded with each other since the bilateral free trade agreement went into effect nearly three years ago, Wang said, adding that a final tax reduction will be implemented on Jan 1, after which almost all goods will be tariff-free. China has never adopted a unilateral protectionist policy in trade; instead, it welcomes more quality goods from Australia entering the Chinese market, Wang said, adding that he hopes Australia will provide a more open and fair environment for Chinese investment. Payne told reporters that Australia recognized the importance of welcoming Chinese investment, saying it had grown strongly over the past five years. Australia “reinforced the importance of the value of Chinese investment”, she said, adding that “we welcome foreign investment because it supports jobs and helps increase living standards”. It was the first strategic dialogue since Australia’s new government took office and an important contact after bilateral ties went through twists and turns. It provided a platform for strategic communication to face common global challenges, Wang said. 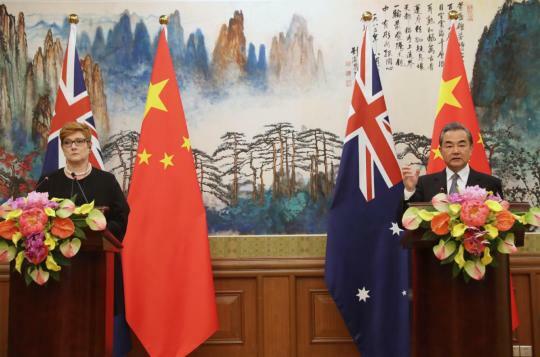 The dialogue defined the right direction for China-Australia relations, Wang said, adding that the dialogue set the course for a more rewarding journey. China hopes that Australia will correctly understand China’s development path and strategic intentions, and strive to eliminate the “mutual trust deficit”, he said. He said that China always adheres to peaceful development and win-win cooperation, and has no tradition of expansion or infiltration. Wang said he noticed that the new Australia government had made remarks regarding China’s development as an opportunity rather than a threat, believing it will further translate its goodwill to turn ties with China into practical action. Payne said a prosperous China provides positive energy to the world, and Australia will not view it as a military threat. She reinforced Australia’s commitment to deepening the comprehensive strategic partnership with China. Australia agreed to promote bilateral cooperation in areas such as trade, agriculture, energy, technology, defense and law enforcement, she said. Noting cooperation with Pacific island nations, Wang said that Beijing and Canberra should be partners rather than rivals. “We can cooperate in this regard, and there is no zero-sum game,” he said, adding that China is glad to see countries in the region develop relations with China and Australia at the same time. He said the two countries could combine their strengths and embark on trilateral cooperation with Pacific island countries. Payne’s visit coincided with Australian Trade Minister Simon Birmingham’s first trip to China. Birmingham is attending the China International Import Expo where he witnessed the signing of business deals totaling A$15 billion ($10.9 billion) between Australian and Chinese companies, according to news reports.